Realising goals with the emphasis on quality, managerial competence and expert personnel. 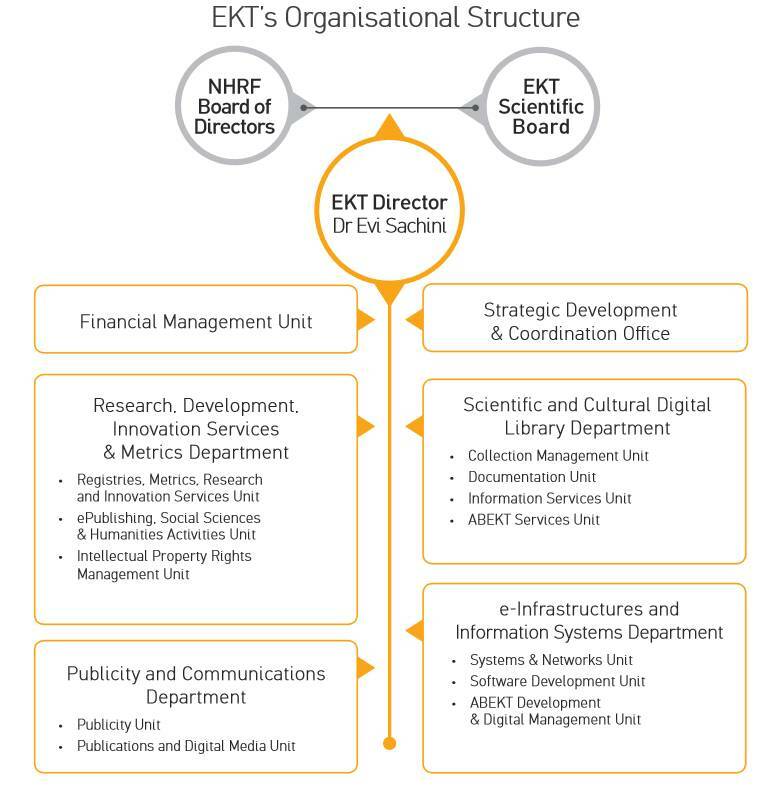 Our institution, the National Documentation Centre of Greece (EKT), located at the National Hellenic Research Foundation, operates under the supervision of the General Secretariat of Research and Technology of the Ministry of Education and Religion. As a national infrastructure, our role is to collect, organise, and preserve the entire Greek scientific, research and cultural output (content and data), while making it available at both a national and global level. We provide a wide range of information about research and innovation issues, support Greek participation in national and European programmes, promote innovative entrepreneurship, and produce statistics & indicators on research, development and innovation in Greece. Our Scientific Board, consisting of distinguished scientists and members of the academic and research communities, contributes to the strategic planning and the efficient operation of the organisation. In 2008, we reaffirmed our managerial capacity, upgraded the operational environment and established the conditions for co-ordinated and effective services, in keeping with the National Strategic Reference Framework 2007-2013 (NSRF). Documented management system procedures cover all critical phases of implementation: programming, maturation, competitions and contracting, monitoring the progress of the project task and financial management. We follow programming protocols, management tools (Action Assignment & Forecast Tool) and standardised internal procedures throughout the life cycle of all national and European projects from strategic planning to the evaluation of their results. Rational organisation and the standardisation of procedures improve the quality of the work environment and services given to third parties. Additionally, they allow the management and evaluation of the organisation's activities, as well as the setting of long-term goals. Within this framework, which is in line with the NSRF programme, and with the aim of more effectively dealing with the requirements of the activities being realised, we have created user-friendly information systems in the form of managerial tools. They not only facilitate dealing with increased procedural complexity and robust monitoring of the progress of the project task generally and financially, but also, by extension, the management of the organisation's internal procedures, in turn, contributing significantly to the upgraded and more up-to-date running of the organisation. Human resources are the motivating force behind the implementation of the centre's strategic and operational goals. The development projects being implemented using state-of-the-art technology require personnel with a wide range of knowledge and skills, experience and commitment. Particular emphasis is placed on attracting and nurturing personnel that can respond to and expand the organisation's activities. At the end of 2015, EKT employed more than 100 employees and collaborators, all of whom effectively contribute to the realisation of projects.